I’m going to show you something today that just might change your life. 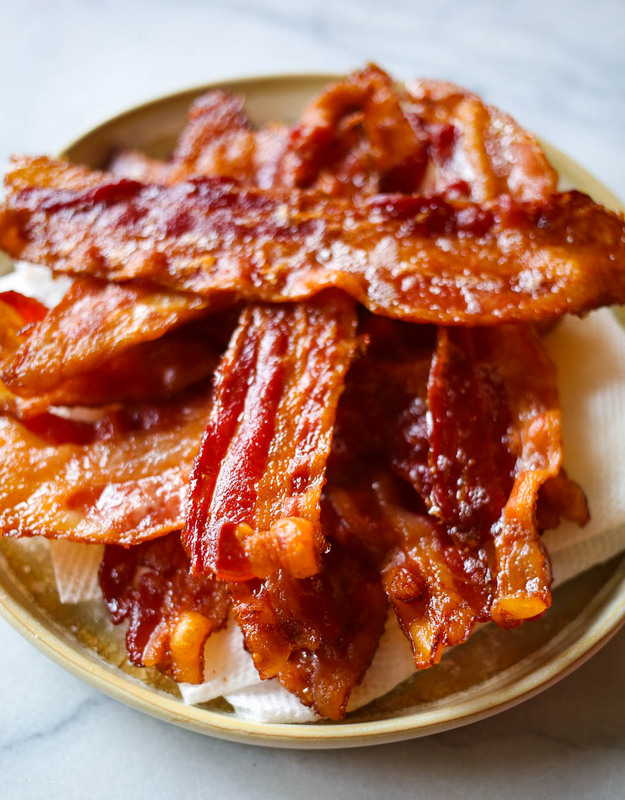 Do you avoid the whole bacon thing because you have to make a big greasy mess, have bacon oil splattered all over the place, and run the risk of scalding your forearms? Well let me show you a little trick where you can cook bacon and not have a single dirty dish. Really, not one! It’s so easy that you might just find yourself cooking bacon every day purely for the purpose of snacking on it. Errr…okay, maybe that’s just me. Pretend I didn’t say that. 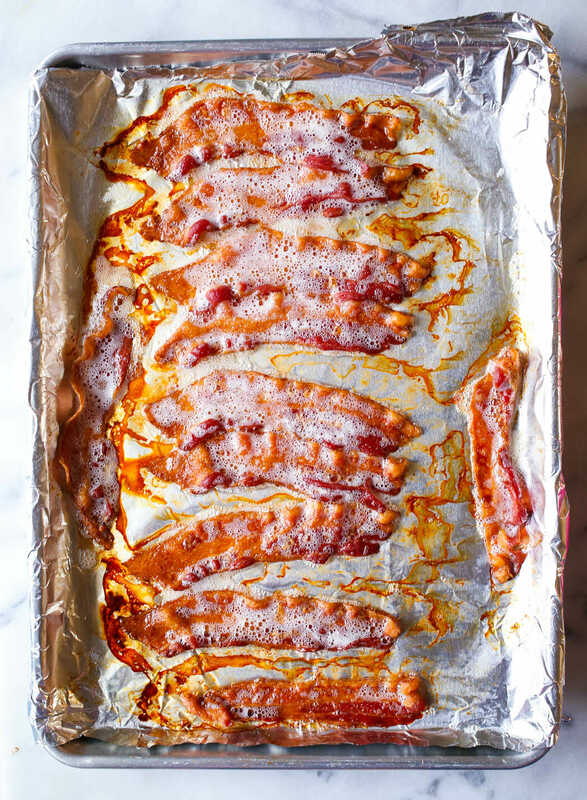 You’re going to need your favorite bacon, a baking sheet, and some aluminum foil. Turn on your oven to 400 degrees F. Line a rimmed baking sheet with foil. Use heavy duty if you have it. Lay out bacon slices in a single layer. They can be close together, just avoid overlap. You can also lay a metal cooling rack in your pan and lay the bacon on top of that. Personally I think it tastes way better when it cooks up in its own drippings! 2. You don’t need to wait for your oven to preheat. Place pan in the oven for about 12-15 minutes. Watch bacon after that and cook until desired level of crispiness. I like mine on the crispy side so I cook it for about 15-17 minutes. Cooking time depends on the thickness of the slice as well. 3. Immediately remove bacon from pan and place on paper towels to soak up grease. Now you’ve still got that pan full of drippings. And I promised no mess and no dirty dishes. Don’t worry, I’m a woman of my word. Note that at this point, you could save the drippings if that’s your type of thing (and according to the comments it’s quite important to many of you!) Or…when your bacon has cooled take the paper towels it was draining on and place them right on the baking sheet. They’ll immediately start soaking up the grease so you don’t accidentally spill on yourself, and this way you don’t have to find something to pour the oily mess into. 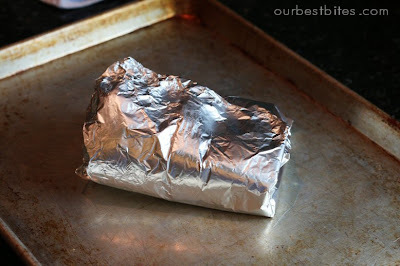 Then take the foil and wrap it right up into itself until you have a little package to toss right in the garbage can. And as long as you didn’t pierce any holes through the foil, your pan is completely clean! Now how easy is that? Plus, you have the best, crispest, flattest bacon, the bacon dreams are made of! I especially love baking bacon when I need a whole bunch to crumble up and sprinkle on stuff like Chicken-Bacon Stuffed Pizza Rolls, Spinach Mandarin Poppyseed Salad, and Bacon & Blue Twice Baked Potatoes. You can be cooking the bacon in the oven while you prep the rest of the food so you don’t have to sit there and babysit a hot skillet. Have you tried baking it with Brown sugar sprinkled on top? Its fantastic! thank you thank you thank you-I can not wait to try this! I just tried this trick this week and loved it. No more wondering what to do with all that grease! I do this all the time. I hate standing over bacon and smelling like it. Oh my word! Now I need me some bacon! We do that sometimes, but more often, especially in the summer, we cook our bacon in the microwave. we line a plate with paper towels, put the bacon on top and then top with a paper towel to avoid the splatter in there. Then we just cook for about 2 minutes, then check after every minute thereafter so it doesn't burn. Wow, I NEVER thought of baking it before (sad, huh? ), but I love it. Mmmm.. bacon. If you brushed maple syrup on top would that make it burn in the oven because of the sugar? Sooooo happy i found this tip. I LOVE bacon but hate cooking it. I'm so excited….and now i'm really hungry for bacon. Alison, yes- LOVE sugared bacon! Erica- I bet syrup would work well too- but try the brown sugar because I know that works! Doehler Days- thanks for the shout-out! Oh my stars girl, don't throw that bacon grease away! I love to cook with it and now that I usually buy the bacon bits, I hardly ever have it around. BTW Hasn't bacon been this big? Has in our house. Love your ideas for serving it, I got some new ideas. . maybe I will have to splurge and go buy some strips. I LOVE this blog. You ladies are the best!! I never knew that it was possible to cook bacon in the oven and I am the girl that always has bacon grease splattered all over the stove, myself, etc. Thank you so much for teaching me this trick. I am going to make my husband's favorite Spanish Rice tonight just so that I can try this bacon-cooking technique. I love to cook bacon in the oven! Mmmm… Bacon! I've always wanted to try it in the oven, but wasn't sure of cooking temps/time, etc. I'll have to try this – my 3 year old LOVES bacon! Mmm… I always save the bacon drippings in a mug in my fridge. Then you can add bacon-flavor to almost anything you cook on the stovetop. Eggs, fried potatoes (hash browns), sauteeing veggies… Yum, yum, yum. Also, the center cut bacon isn't too bad for you – only 1 WW point for 2 slices. And it's REAL bacon, not turkey bacon, which I don't care for. i love the tips in this post. thank you!!! i.love.bacon – it was one of the only things that sounded good when I was pregnant and extremely sick. That and chocolate milk. I'm always overcooking it too – thanks for the tips! I've never done it in the oven. Can't wait to try it! I started cooking my bacon like this a few months ago and I am never going back. When you do find out if you won the contest? Mary- we didn't win 🙁 But we got a LOT of votes from all of you great readers and for that we are extremely grateful! When you just need a few slices or it is too hot to heat up your oven, try a few slices on your George Foreman grill. It cooks quick and cripsy on both sides and the grease drains neatly into the little tray. And there are no spatters all over your kitchen! What a coincidence that you posted about this today! Last night I cooked bacon like this for the first time ever. I actually used a cooling rack over a rimmed cookie sheet, which also worked, but your method is definitely easier to clean up. One method I can recommend NOT to try is crisping them in the broiler. I did this when I was newly married and when I checked them I found the grease had caught on fire. Fortunately, I kept my head and had plenty of baking powder on hand so the only casualty was the bacon itself and, praise the Lord, that was all. what a concept! i love the no frills clean up! awesome! and i love all those bacon cuppie recipes!! i have been wanting to try this for a while, as i love the sweet/salty thingy! this is inspiration1 thanks for sharing! I've been following your blog for about 2 weeks now and love everything on it. I can't wait to make the pies in a jar. They look so cute and yummy. I started cooking bacon in the oven just a couple of months ago and it is THE ONLY way that I will cook bacon now. It's so worth the time and so easy to do! Also, another fun option for people who like pepper is grinding fresh pepper onto the bacon before cooking it. That's good too if you like peppery bacon! One last thing. This is another quick and easy way to cook bacon. We like it okay. It isn't as yummy as the oven baked bacon, but it is fast and clean up is pretty minimal. You just have to wait for the grease to harden, then throw away. I did discover baking bacon a while back and it is far better than the old iron skillet, for sure. However, I am shocked at the unfriendly treatment of bacon grease… 😉 I keep it and use it for a variety of cooking purposes. I'm old school that way, though. I have used this trick many times and absolutely love it! The other great thing about this tip is that your house doesn't smell from cooking either. This is genius! Why didn't I think of this? Is there a way to keep the bacon greese from splattering on the oven walls? Can you cover it with something? Does it splatter less in the oven compared to a fry pan? We cook in the frypan w/lid, and it still leaves behind a mess on the stove. I guess I will have to just try it, who knows, maybe my bread would taste good with a hint of bacon. Love your blog! Thanks!! I was wondering the same thing. That seems like a way bigger mess to me or at the least your oven is going to smell like bacon every time you use it and possibly give off a bacon flavor to everything you cook. I’m curious to know what you learned if you did it. Lamberts- honestly, it doesn't make a huge splattery mess in the oven- that's why I do it this way! I made breakfast for dinner tonight, and I cooked the bacon using this method. Thank you for posting about this, because it really was wonderful. I even think it made the bacon taste better than usual. I used this tip this weekend – so much cleaner and easier than microwaving! Thanks! I love to cook it in the oven…SO easy! I use the broiler pan (you know the one that comes in the oven that is only good for this and making a meatloaf on) then the grease all drips below. Perfection! 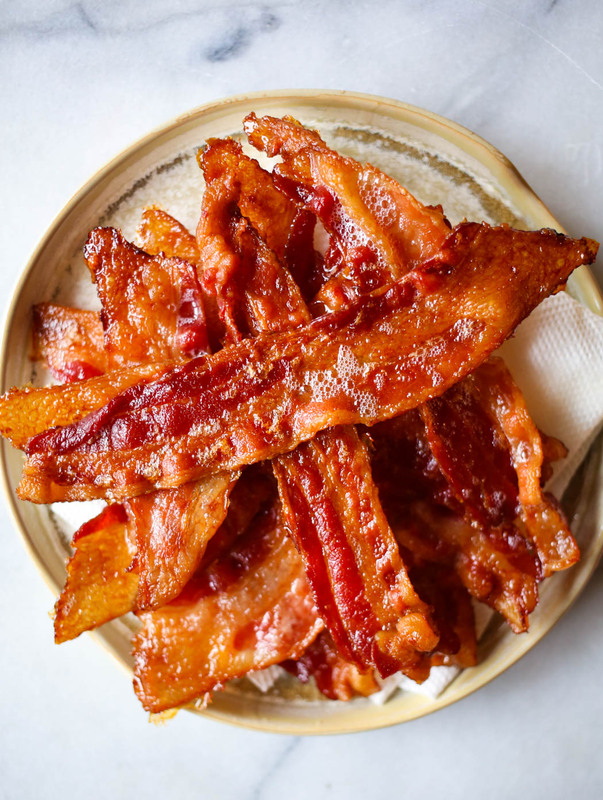 We eat bacon ALL of the time (more than we should!) and tried this method last night in the oven. GENIUS!!!! Even my skeptical skillet loving husband was so impressed as to how amazing it tasted, how perfectly it cooked and how crunchy it was. THANK YOU for this fantastic tip. It worked. Thank you for that awesome tip. 16 minutes made for perfect bacon. Thanks for the tip. I always end up doing it by hand on my griddle. Thanks for the time saving tip. I am going to try this Saturday Morning. FYI, Erica– I was just looking at the Barefoot Contessa at Home cookbook and she cooks bacon this way for 15-20 minutes, then brushes maple syrup on top and bakes it for another 3-5 minutes. That is the best tip ever. I've done it twice now. I love how the whole package fits on the sheet (barely), and there's no splattery mess, and no fussing with it. And, it stays flat. Genius. I love this! It'll really cut down on mess & dishes in my kitchen! 🙂 Oh and I have to mention, just because it was amazingly delicious when we first tried it, bacon is also really good in pancakes. I know it may not sound like it would be good, but we had bacon pancakes at a breakfast place in San Diego & got hooked! Everything about this post made me hungry. This is the best post ever! combine it with the this tip if the only other people in your house are (say) cats – bring home the bacon, seperate it into portions, say 4 strips each out of a 16 strip package. 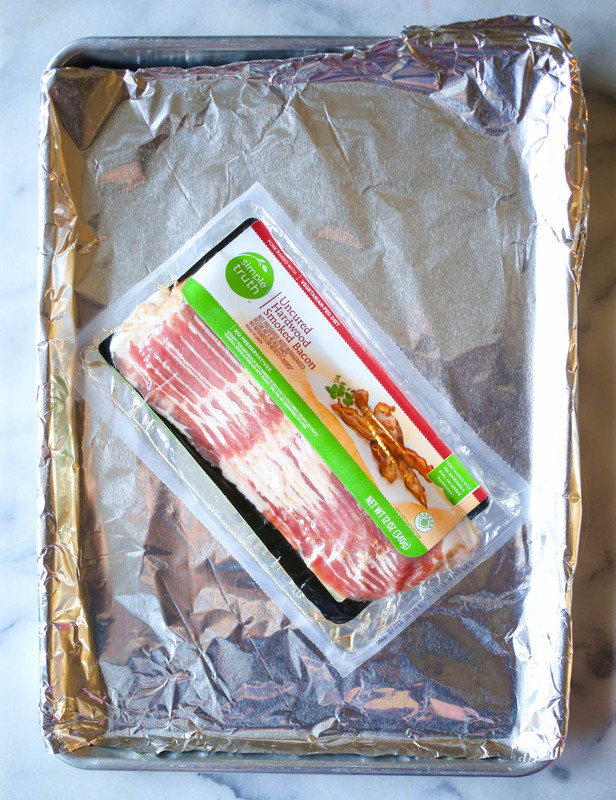 Lay the strips side by side on a piece of saran-wrap, then fold the wrap over on itself and the bacon lengthwise until you have a little sealed pack. Wrap the plastic wrapped packs in foil wrap. When you need a little bacon take out the big package, then take out a little plastic wrap of your 4 slices, unwrap those. they will be perfectly stiff separate slices that you can pop onto your foil then into the toaster oven. BLT-ready in a snap. This is a great tip, just curious if the bacon grease makes a mess to the 'oven'???? My all-time favorite way to cook bacon! Not for the mess, but because it doesn't splatter all over my glasses while I'm baby-sitting it. I use my pampered chef stone to do it, and then there's even less grease, and it seasons the stone as you go. Thanks so much! I hate the mess/smell/burnt arms/drama of cooking bacon. I'm going to try this tonight! I have steered away from bacon for a long time mostly due to the mess of cooking. I just made a batch in my oven and it came out so well, and such a minimal mess for BACON! We use parchment paper and it's dreamy – no sticking! The best is once the bacon's close to being cooked to your liking, drizzle with maple syrup (we just use Aunt Jemima's original pancake syrup) and cracked black pepper. SO YUMMY! It's a BLT day and I had to hop on here to see how to bake the bacon. Mmmmmm. I hate how when I skillet fry bacon I always smell like it afterwards and feel like I'm covered in grease. This way is truly so much better! Thanks chickas. TOOO EASY! Just made some perfectly crispy and FLAT bacon:) LOVE the site! Just tried, it’s the best looking bacon I’ve ever made. Man, you guy’s make me look good. BTW- I’m using this for your Baked Potato Soup. Oh girl, I am ALL over this the next time I need bacon. I cooked my bacon on a George Forman Grill, but then I have to cut the pieces in half and only get 5-6 half-slices at a time. I will do this next time. My girlfriend freezes it after baking so her Saturday Breakfast time is quicker–but I personally have not done this. We’ll be trying this method this weekend – as a full-time working mom I need all the short-cuts I can get! I think this post just changed my life. I love bacon, but I hate cooking it. I never cook bacon, if we ever have any my husband cooks it. I also like crunchy bacon, which is really hard to do on a skillet because it burns so easily. But putting it in the oven, and not even having to wait for it to preheat? That’s just too easy. Thank you! I tried this for brunch this morning and my husband was hovering over me asking if I was sure it was going to work. He is used to microwaved bacon which I am trying to get away from. He was nervous that it wouldn’t get crispy. When he and my son ate it they said it was the best bacon they had ever tasted. I told them that Sara and Kate could be trusted. Unlike some of the other sketchy recipes or methods I have tried from the internet. Thanks ladies! I use this all the time. I love not having to clean up the bacon grease spattered all over my stove, and that I can set the timer and walk away. My husband has seen me make it like this many times, recently he went to a Men’s Breakfast at our church. He ended up helping cook the bacon, and he cooked it like this. All of the men were raving about how good it was and some of them even came up to me telling me how great it was. Thanks so much! I tell people about your blog all the time! Just tried it. Worked like a charm. I am NEVER going back to the skillet for cooking bacon. Have I told you lately how awesome you are? Awesome. Totally. Hope you are enjoying Hawaii. Okay, I love this for so many reasons! One inparticular is I hate when I’m trying to make something, and I am running out of skillets, or even room on the stove top. This is perfect! I can’t believe I haven’t been doing this all along! Thanks! Bacon!So good that it’s even good on a salad! A salad!!!!! Tried this morning. Loved it! Cooked evenly and little mess. I have cooked bacon like this for years-love it. Here’s the problem- I have never ended with a clean pan! One thing that I haven’t done before is use the paper towels to soak up extra grease, so I tried that with such high hopes. Sad to say after soaking, cooling, extra… I lifted up the foil and dang! -still greasy? I overlap the foil layers a lot and make sure it wraps up over the edges, I don’t poke holes- what am I missing???? What a great way to cook bacon without all that crazy grease to clean up. Can’t wait to try it! Friends & family make fun of my love for bacon! Who cares, right? The oven, pan fried & microwave all tend to have a different taste & texture. Baking is the very best! I try to find the THINNEST sliced I can find…cooks up crisp & not hard. And I like that with the right pan…I can cook LOTS at one time. Found a butcher who says he’ll slice some FRESH bacon as thin as I want it! OMG! Sounds great!! and the other recipes you have at the end look heavenly!!! I’m trying your breakfast bacon and potato recipe tonight! I wasn’t much looking forward to cooking the bacon… but now I can’t hardly wait to give this a try. So perfect for a busy mom!!! I guess I’ve been stalking here since I use your recipes often but have never commented! Not that I remember, anyway. 🙂 I have loved every recipe I’ve tried. My husband has never liked meatloaf before, but I baked it as a shaped loaf wrapped in bacon (with the sauce spooned on top) on a broiler pan. He’s sold on it. 🙂 Just another thing to use bacon with! Thanks for your wonderful blog. It’s everything a recipe blog ought to be! I realize I’m like years late to this conversation, but does the bacon splatter all over the inside of your oven when you cook it in there? Hi, Have you ever tried to cook your bacon on your “GEORGE FOREMAN GRILL”. Works really slick, no splattering, cook your bacon as “crispy” as you like it and clean up is a breeze. Give it a try, if you haven’t already. Or…instead of tossing those bacon soaked paper towels, put them in a plastic bag and stick them in the freezer. Next time you want to barbeque, use them as non chemical fire starters for charcoal! Instead of using paper towels to soak up the grease from the pan, if there are no holes in the foul then place it in a bowl and let the grease turn solid. Then close foil into a ball and throw away. Found this idea in Pinterest and it works great!! Thanks for the tip! This worked great & saved me having to wash yet another pan as I am cooking & baking for Christmas. Love it!! Yeah! A girl after my own heart. Years ago my father-in-law said bacon was better cooked in a skillet and my sweet mother-in-law always wanted to please him and I thought they were both crazy since the microwave was faster and cleaner. However, I have become a oven cooked bacon convert. You really have to watch those last few minutes so be careful. It has the advantage of been the best texture and the easy clean up. Question: Can you put more than one pan in the oven at the same time, or does it mess up the heat flow thing like it does with rolls? And really ,truly, is there NO mess in the (regular) oven? Or is it just a little mess in the oven. I’m a bit chicken after having flames come out of my toaster oven from not cleaning out my crumb tray in a timely fashion. Won’t do that again. I’ve been doing this for a while now and it really is the best way to cook the bacon. Becky B, it does mess up the heat flow (for me at least). I usually have to cook the top pan around an extra 5 minutes. And yes, there really isn’t any mess in the oven so long as you don’t take it out too fast because the bacon isn’t cooking at so high a heat that the grease splatters like it does on the stove top. 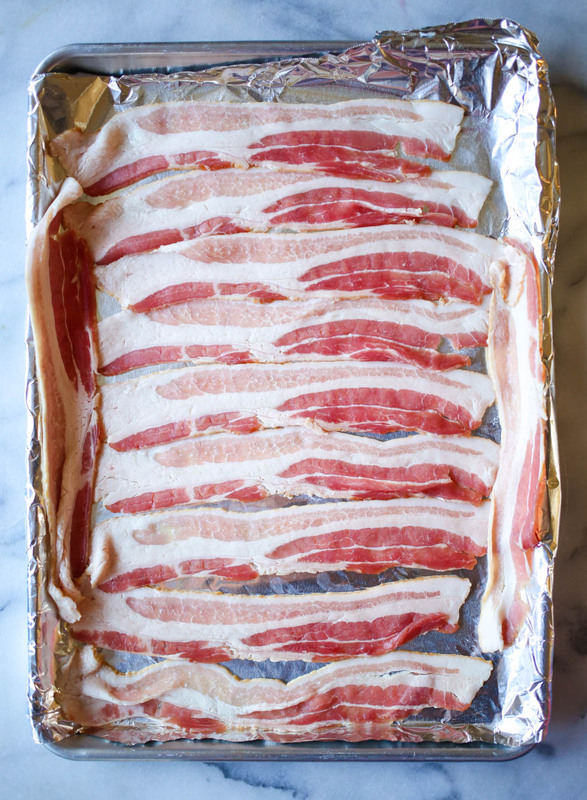 When I do my bacon in the oven I place paper towel on the foil then place just enough water to wet the paper towel. I then put a cooling rack on top of the paper towel with the bacon on top of the cooling rack. It keeps the grease from splattering and cooks the bacon with out drying it out. The paper towel soaks up the grease so there is no chance of a spill taking it out of the oven. I do this, but I still end up with bacon grease on the INSIDE of my oven – I find myself having to clean the entire oven after each bacon cooking – any tips for how to avoid this? Thanks! Did you see Diana’s suggestion? Maybe try that. I’ve never had a problem with it splattering, so I’m not sure! You are right, bacon rules, no doubts. Do you think that it would be ok to use parchment paper instead of the aluminum foil? Or would it burn up in the oven? In a pinch it would probably work, but I’ve never tried it. In comment 52 above, she says she uses parchment paper with success. I put another piece of foil on top and put a glass pan on top and then you have flat pieces for sandwiches and easy to freeze. Solely vacuum packed bacon freezes properly, for up to 2 months.